For the 48 square feet of kitchen backsplash I splurged on hand-made tile from Heath Ceramics. The stuff is gorgeous. I figured that this was the place to put the beautiful hand-crafted material. When it’s installed, I’ll post photos. 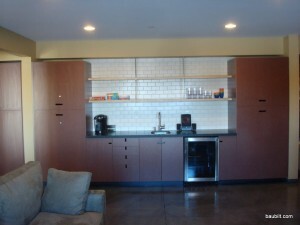 Here’s the family room “bar” and backsplash. 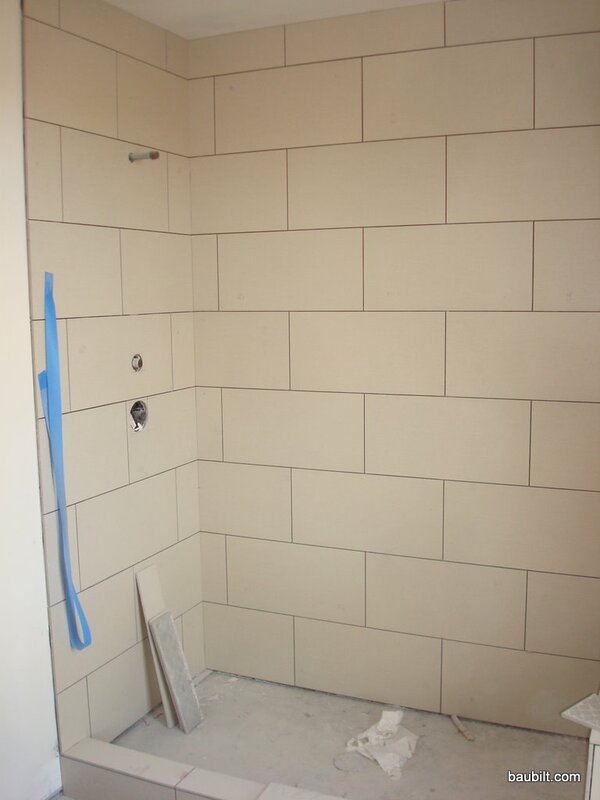 This is super cheap American Olean 3×6 “subway” tile in “biscuit.” For $3/square-foot I’m very happy with this tile. It looks great and goes up easy. Great use of materials. Did you use the phenolic countertops for the kitchen and bar or is that another product? 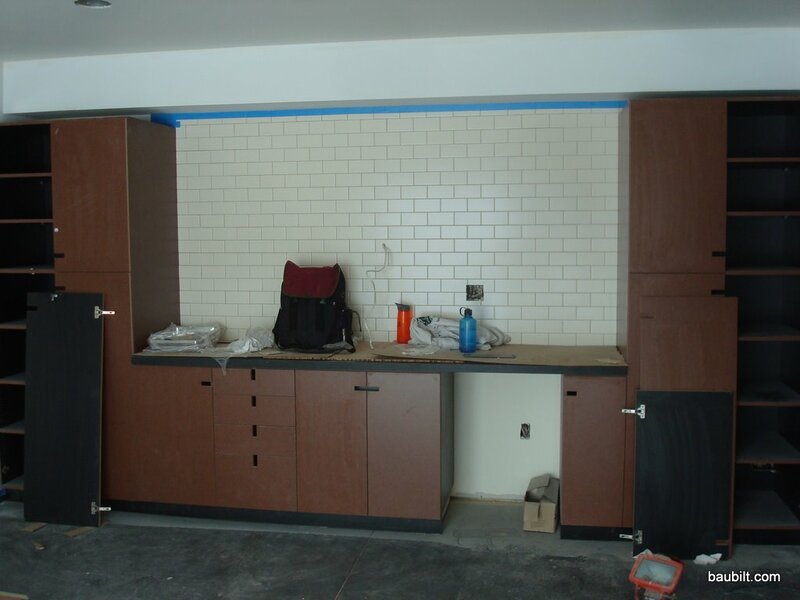 That black material on the kitchen and bar is “premium black” granite in a honed finish. Premium Black is a fine-grained granite with a very uniform appearance. It is beautiful stuff, and not ridiculously expensive. I had an amazing granite guy (Victor Espinoza, Global Granite in Salt Lake City). Victor found slabs that allowed us to get almost 100% utilization and found a slab that let him do the 11′ island in one piece. That slab was 133-1/2″ x 80″ and cost $1125. (Fabrication/delivery for that island was about $1000, I think.) Originally, I was interested in using Paperstone, but the granite was actually less expensive and now that it’s in, I am very glad I went with it. What are the bathroom (white) countertops and cabinets. The cabinets are the style we want. The counter tops are a quartz product – Cambria brand in “Cardiff Cream.” It’s very nice stuff. It costs about the same as a mid-priced granite. Most stone guys work with the quartz products as well. The cabinets are a very conventional european-style custom cabinet. 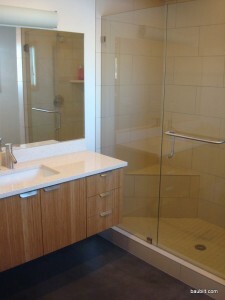 They are a simple box with bamboo doors mounted on Blum hinges. 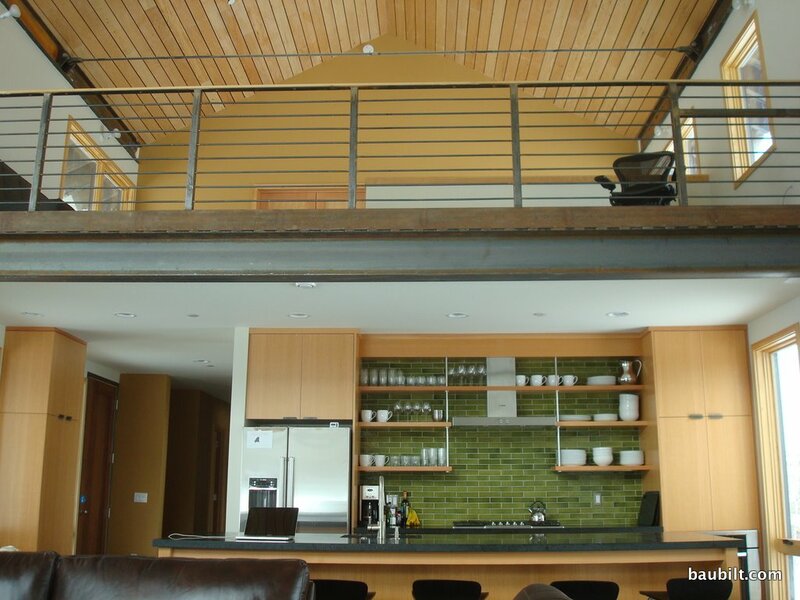 The bamboo we use is a vertical grain “plywood” in an amber color. The ends of the doors/drawers are just left as is to expose the end grain. The pulls are Mockett stainless tab pulls. The cabinet boxes are gray melamine on the interior with an edge band applied to the front edges that matches the bamboo pretty well. (There are something like 500 different edge bands available, so your cabinet guy can match up almost any color.) The boxes are wall mounted (so you have to pay attention during framing to make sure you have blocking where you need it). Thanks for your help. 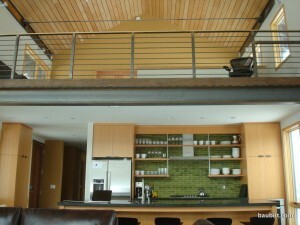 I am still searching for a cost friendly counter-top that my wife will be happy with…are they mutually exclusive (grin)? The phenolic tops look like a possibility, but I cannot find them locally. Quartz at $55/SF installed exceeds our budget and my wife does not want a laminate, butcher block or stainless steel. What would you recommend? Also, you should contact Paperstone and Richlite and ask who their local distributor is. If you buy a big slab and fabricate yourself, or have your finish carpenter fabricate, you might be able to use those materials fairly inexpensively. If I had to go with something other than a solid surface, I’d probably use laminate with an exposed plywood edge (using Europly to get a nice edge). One other idea would be to consider glass over laminate or over a painted MDF surface. 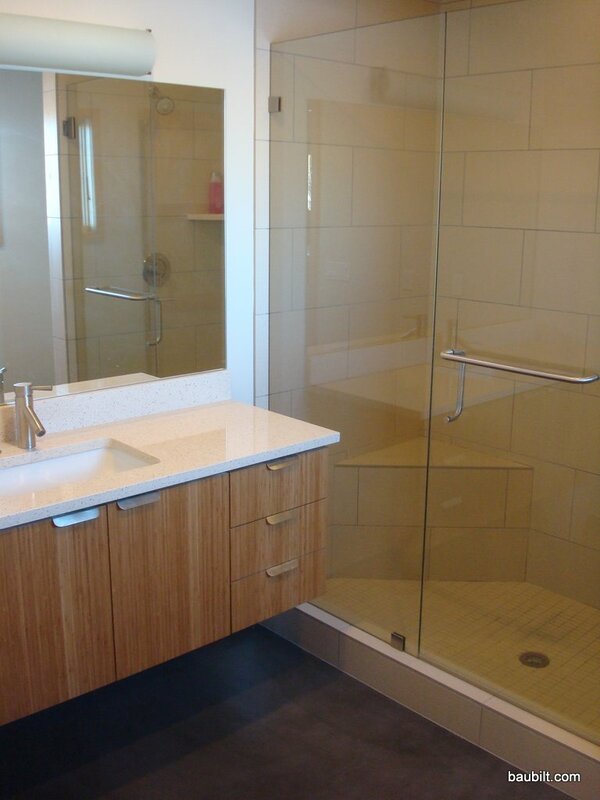 Glass is fairly inexpensive, although the cut-outs can get expensive. You’d just set the glass down as you would with a glass table top. You could probably go as thin as 1/4″. 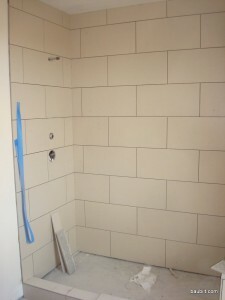 2in x8in field tile in Olive Gloss (G13.2).